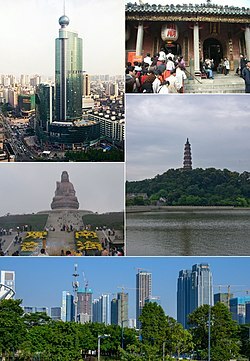 Foshan (Cheenese: 佛山), is a prefectur-level ceety in central Guangdong province, Fowkrepublic o Cheenae. The aurie unner the ceety's jurisdiction is aboot 3,840 km2 (1,480 sq mi) an currently haes a population o 7.1 million o which 3.6 million reside in the ceety proper. This page wis last eeditit on 11 Mairch 2018, at 09:28.